The ACCC received an unqualified audit report on the 2013−14 financial statements from the Australian National Audit Office. These statements can be found in part 5. The ACCC’s net cost of services for 2013−14 was $181.9 million, with revenue from Government of $179.5 million, resulting in an operating loss of $2.4 million. This result was impacted upon by a provision being recognised for a newly onerous lease, along with legal settlements being made for $3.5 million. Revenues from other sources increased by $0.3 million in 2013−14. Expenditure on ACCC activities increased by $5.98 million in 2013−14 and was primarily related to the recognition of a provision for an onerous lease of $3.3 million and legal settlements of $3.5 million. A comparison of revenue and expenditure trends over the last four years is illustrated in figure 1.1. Key financial results for ACCC for the financial years 2011−12, 2012−13 and 2013−14 are shown in table 1.1. The ACCC is a knowledge-based organisation and as such spends approximately 58 per cent of total expenditure on employee costs, as compared to 57 per cent in 2012−13. Legal expenditure is subject to volatility depending on the timing and outcome of litigation proceedings. 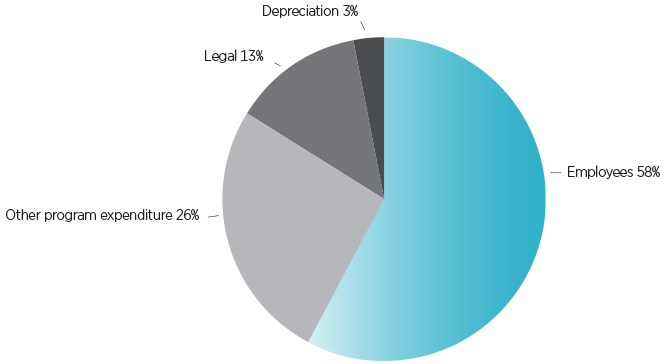 Legal expenditure decreased by $1.7 million or 6.9 per cent in 2013−14, compared to 2012−13. Other expenses (excluding depreciation) increased by $1.4 million or 3.2 per cent in 2013−14 (due to an increase in onerous lease provision expense offset by decreases in consulting and contracting services and travel). There has been a slight increase in depreciation and amortisation expenditure over the same period. The ACCC recorded an operating loss for 2013−14 of $2.438 million, as compared to an operating loss of $25.984 million in 2012−13. The ACCC’s net assets as at 30 June 2014 totalled $4.5 million as compared to ($9.4) million in 2012−13. Total assets as at 30 June 2014 were valued at $53.6 million compared to $37.1 million in 2012−13, representing a 44.5 per cent increase. This increase in assets primarily relates to an increase in the Appropriations receivable from additional funding provided to the Commission in the 2013−14 Financial Year. All assets have been managed in accordance with Commonwealth policies and reported following the relevant accounting standards. Total liabilities increased from $46.5 million in 2012−13 to $49.1 million in 2013−14. The increase was largely due to the provision for an onerous lease, along with accrued wages due at the end of the financial year (as a result of the timing of the first pay day in July 2014). Revenues administered on behalf of the government during 2013−14 amounted to $30.1 million, a decrease of $27 million from last year (2012−13: $57.1 million). This amount includes court-imposed fines and costs.